Not all employees need full access to employees information, but someone like a newly hired HR manager will. This is how you can give someone Super Admin to your Collage platform. Wan't grant an employee more access, but not full access? Check out Custom Roles. The first thing you will have to do is navigate to the Roles & Permissions page. You can do this by entering the company settings, scrolling down and clicking this section. Once you are on the Roles & Permissions page you will see a list of Default Roles and Custom Roles. 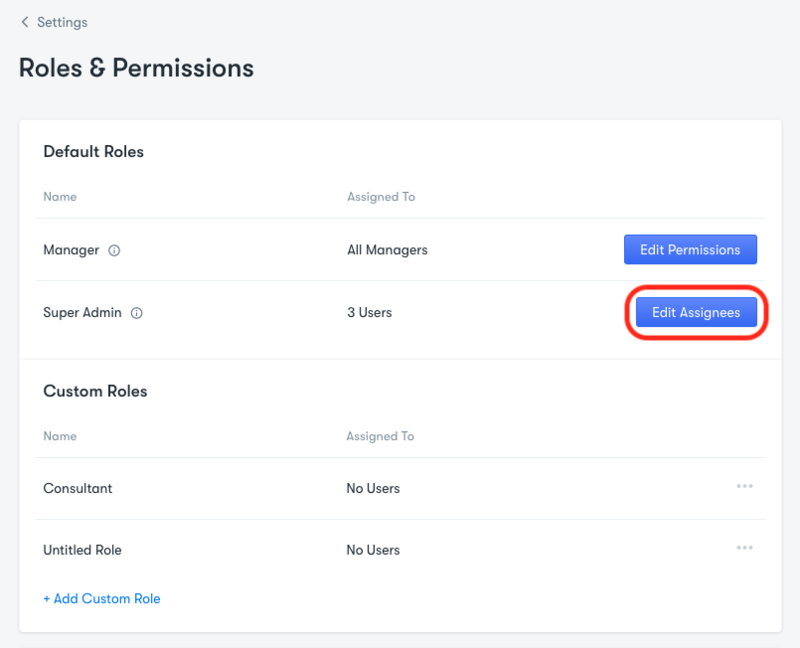 You can add or delete employees from the Super Admin role by selecting the Edit Assignees next to the role. Here you will be able to view who is current assigned to the role, add assignees, and delete assignees from the admin role. To add an employee you have to click on the box the names are listed and a drop down will appear. You can scroll through he list, or type to search through it. Select the employee you wish to add. Note: The Super Admin role allows full access to all features and all employee info. Permissions cannot be edited or deleted. Users can be assigned to this role, but it should be done with caution! You are giving them the highest level of access. Learn more about the Super admin role here. To remove an employee as a Super Admin all you have to do is click the X next to their name.